Scientists say they have calculated the date at which the African and the Asian elephant went their separate ways. 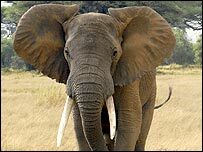 The two elephant species diverged from a common ancestor some 7.6 million years ago, experts working in the US, Germany and Switzerland say. They came to their conclusion after comparing a genetic analysis of the two species with material derived from the extinct woolly mammoth and mastodon.